A career in horticulture has taken former Woolgoolga High School student Melissa Mullee around the globe, and now she’s encouraging school leavers to consider the benefits of working in this diverse field. 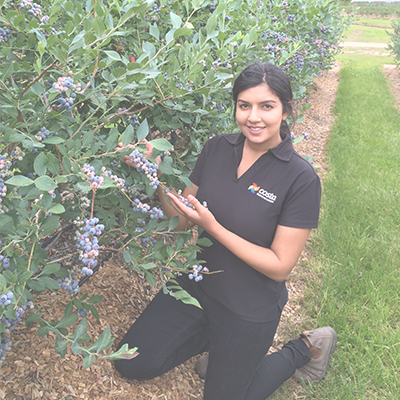 Ms Mullee is the Irrigation and Nutrition Manager for the Costa Group Berry Category, based at the 360 hectare blueberry and raspberry farm in Corindi. She was employed at Costa straight after graduating with a Bachelor of Agriculture from University of New England, and in the five years working for the company she has travelled to America, Mexico, Thailand, China, the Netherlands and England. “I just love it. I have always loved things to do with plants. I grew up in Woolgoolga and went to Woolgoolga High School and I used to help out on my parents farm,” she said. I started a degree in agriculture/law at the University of New England, but I realised after six months I just wanted to do agriculture. “I have had the most amazing opportunities travelling to different countries. I have been involved in setting up trials and new farms. Every day is different and I love being outdoors." Sheldon Jacka, the Human Resources Manager for the Costa Berry Category, said horticulturalists were in high demand across the sector. “We are constantly on the lookout for qualified horticulturists. We see this as an area of increasing demand and there are some really good career paths available,” Mr Jacka said. Costa is Australia’s leading horticultural company with operations covering berries, mushrooms, citrus, glasshouse tomatoes and avocadoes. It has more than 3500 hectares of farmland spread across the country.